"This dish was originally called 'Chicken a la Keene' after Foxhall P. Keene, the son of a well known Wall Street broker. The name evolved into the more regal sounding 'Chicken a la King' and here you have it. Long live the king!" Melt the butter or margarine in a 3 quart saucepan over medium high heat. Saute the bell pepper and mushrooms, stirring occasionally, until the bell pepper is crisp yet tender. Stir in the flour, salt and pepper and saute over medium heat, stirring constantly, until bubbly. Remove from heat. Stir in the milk and broth. Heat to boiling, stirring constantly. Boil and stir for 1 minute. Stir in the chicken and pimentos and cook until hot. Serve over the rice. Ditch the pimentos and green peppers and replace with mixed vegetables (corn, peas and carrots - I use a bag of the frozen variety). This is the recipe I remember as a kid and it turns out great. 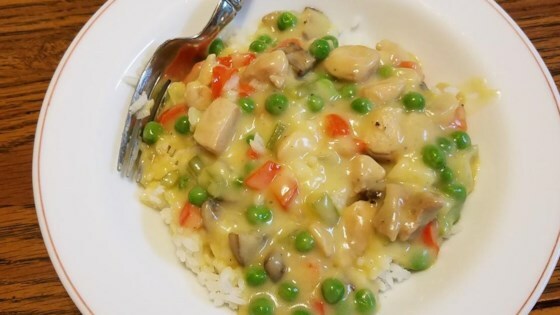 I really like this recipe - reminds me of my childhood, having lunch with my mom and sister. I omit the rice though and serve it over a slice of white bread like mom used to do!